The COOL EGGSPRESS™ Egg Transport System is the newest and most dynamic innovation for the egg industry in years. With new USDA guidelines on the horizon, consider the benefits and savings this new system will bring to your entire organization. Why are so many choosing COOL EGGSPRESS™? 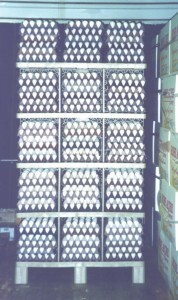 What is it that makes COOL EGGSPRESS™ so much better than traditional egg shipping racks? More efficient and effective washdown results in a healthier environment. Faster, better and uniform cooling of all eggs, from top to bottom, as well as inside and out. Reduces possibility of transporting disease from one site to another. Anti-microbial additives available upon request. Panels can fit through most industry automatic washer systems, for easier and more thorough sanitation. UV protected plastic material provides sunlight protection and prohibits materials from becoming brittle, which eliminates damage over time. Weather resistant, eliminating warping – versus a plywood system that deteriorates from sunlight or outdoor storage. Non-porous material provides a more sanitary surface, easier to clean – versus plywood which absorbs dirt and is virtually impossible to keep clean. Patented air flow system provides uniform cooling – versus plywood systems which trap hot air. Designed to be stronger and more durable for less loss versus a plywood system. Eliminate wood related injuries – no more splinters or cuts and scrapes from nails, staples, or rusting metal supports. The patented hand-hold design eliminates pinched fingers from wrestling with plywood shelf systems. Specially designed shelves keeps flats from shifting during transit. UV protected plastic lowers maintenance costs for the life of the system. Lower annual costs than wood systems. A stronger design results in less breakage and lower replacement costs. Enjoy a seven to ten year average life on each system. Clean-up is quick and easy due to the COOL EGGSPRESS™ system’s non-porous polyethylene material. Know exact quantities on hand at a glance. 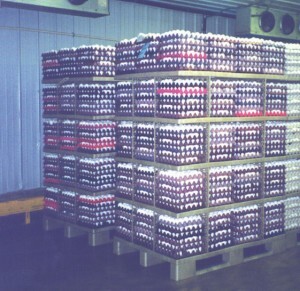 Reduced Loading Costs:Tongue & groove design makes loading eggs from either side faster and easier. Eliminate the need for top-cover egg flats, cardboard corners, and shrink wrap. The patented hand-hold design provides faster assembly and dis-assembly. The five-tier design provides even weight distribution resulting in reduced damage.A pallet designed for pickup from either side, by hand-truck, forklift, or power trucks. Fit 23 COOL EGGSPRESS™ pallets in a trailer versus 20 wooden pallets, representing a 15% increase in shipped product per shipment. Quantity pricing is available from the exclusive distributor of the COOL EGGSPRESS™ system, Saybrook Marketing Group, Inc. The 49″x37″ design fits in a trailer in either direction. Field-engineered and tested for over ten years. 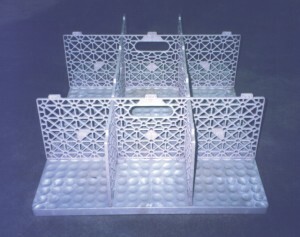 Positive, locking dividers for easy loading. Easy to assemble and dis-assemble. Patented dimple holding pattern on each tier reduces egg flat movement. Usable in smaller sites as well as large operations. Patented tongue & groove design makes the system more solid and rigid. 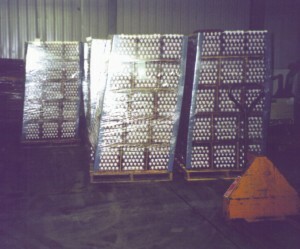 Fitted pieces provide less rocking and tilting during shipment, reducing egg loss. The COOL EGGSPRESS™ system will give you a jump on pending and/or proposed USDA shipping, cooling, and cleanliness guidelines. The COOL EGGSPRESS™ system uses USDA-approved materials. 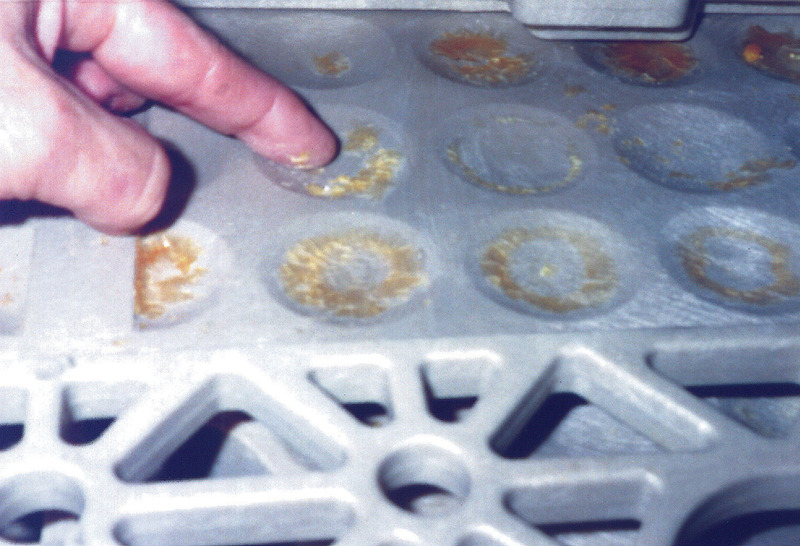 The COOL EGGSPRESS™ system reduces microbial risks with processing materials, for HACCP hazard analysis. The COOL EGGSPRESS™ system is environmentally friendly and 100% recyclable.